The ultimate goal of life is the attainment of love for God. Srila Prabhupada repeatedly emphasized that human life is meant for self-realization, and that perfect realization is that everyone is the eternal servant of the Supreme Lord. This is called sandarbha, the understanding of our relationship with the Absolute Truth. After understanding one's relationship, the next understanding should be how to act in that relationship, and this is termed abhidheya, or devotional service to the Lord. The question would then arise, "What is the ultimate goal of such engagement in devotional service?" This is called prayojana, or life's ultimate goal. It has been concluded that as devotional service to the Lord advances, one approaches one's constitutional position of loving the Supreme Lord. This Priti-sandarbha is a treatise on life's ultimate goal, love of Godhead. In his purport to a verse of the Sri Caitanya-caritamrta by Srila Krsnadasa Kaviraja Gosvami (Adj 7. 89-90), Srila Prabhupada wrote: Srila Jiva Gosvami, in his Priti-sandarbha (66), explains this stage of love of Godhead: Transcendental love of Godhead is not under the jurisdiction of the material energy, for it is the transcendental bliss and pleasure potency of the Supreme Personality of Godhead. Since the Supreme Lord is also under the influence of transcendental bliss in love of Godhead, one's heart melts, and the symptoms of this are standing of the hairs on end, etc. Sometimes a person thus melts and manifests these transcendental symptoms yet at the same time is not well behaved in his personal transactions. This indicates that he has not yet reached complete perfection in devotional life. In other words, a devotee who dances in ecstasy but after dancing and crying appears to be attracted to material affairs has not yet reached the perfection of devotional service, which is called asayasuddhi, or the perfection of existence is completely averse to material enjoyment and engrossed in transcendental love of Godhead. It is therefore to be concluded that the ecstatic symptoms of asaya-suddhi are visible when a devotee's service has no material cause and is purely spiritual in nature. "Jiva Gosvami has got six Sandarbhas, theses: Bhagavat-sandarbha, Krsna-sandarbha, Tattva-sandarbha, Priti-sandarbha, like that. So, I don't think that these books are published in English. These Sandarbhas of Jiva Gosvami are so philosophically discussed that throughout the whole world, there is not a single philosopher who can defy them. We belong to the Gaudiya-sampradaya from Lord Caitanya Mahaprabhu, coming in the disciplic succession of Caitanya Mahaprabhu. We have got immense literature to understand God. One who wants to understand God through philosophy, science, argument and logic, to supply them reading material, we have got immense literature, Vedic literature.". 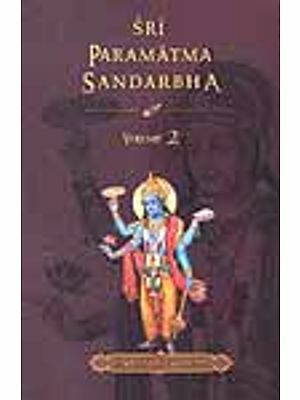 In the Krsna-sandarbha, second-to-last text, Srila Jiva Gosvami explains: The description of sambandha (the relationship between the individual living entities and the Supreme Personality of Godhead), which has begun in the Tattva-sandarbha, and continued in the Bhagavat-sandarbha and Paramatma-sandarbha, is now concluded in this Krsna-sandarbha. 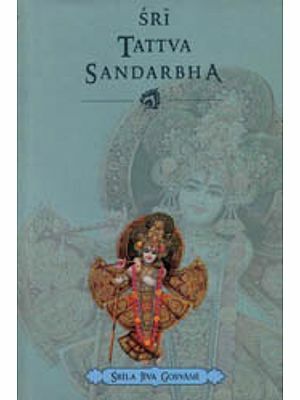 In the next book (Srimad-bhakti-sandarbha), I shall describe abhidheya (devotional service, or the activities of the relationship between the individual living entities and the Supreme Lord) and in the last book (Pritisandarbha), I shall describe prayojana (pure love for Krsna, the result of engaging in the activities of devotional service). This Priti-sandarbha is a treatise on life's ultimate goal, love of Godhead. Although love of God may seem to be simply an emotional state, the characteristics of love of God have been explained by the great acaryas in greate detail. This is very important because for one, there are many imitators who pose themselves as fully realized devotees of the Lord in the hopes of fulfilling some personal motive. This is also very important because, although a neophyte devotee may sometimes experience symptoms of transcendental ecstasy while engaging in devotional service, he should understand that this does not indicate that he has reached the spiritual platform, as long as he is still attracted by the material objects of the senses. In his purport to a verse of the Sri Caitanya-caritamrta by Srila Krsnadasa Kaviraja Gosvami (Adi 7. 89-90), Srila Prabhupada wrote: Srila Jiva Gosvami, in his Priti-sandarbha (66), explains this stage of love of Godhead: Transcendental love of Godhead is not under the jurisdiction of the material energy, for it is the transcendental bliss and pleasure potency of the Supreme personality of Godhead. Since the Supreme Lord is also under the influence of transcendental bliss, when one comes in touch with such bliss in love of Godhead, one's heart melts, and the symptoms of this are standing of the hairs on end, etc. Sometimes a person thus melts and manifests these transcendental symptoms yet at the same time is not well behaved in his personal transactions. This indicates that he has not yet reached complete perfection in devotional life. In other words, a devotee who dances in ecstasy but after dancing and crying appears to be attracted to material affairs has not yet reached the perfection of devotional service, which is called asaya-suddhi, or the perfection of existence. One who attains the perfection of existence is completely averse to material enjoyment and engrossed in transcendental love of Godhead. It is therefore to be concluded that the ecstatic symptoms of asayasuddhi are visible when a devotee's service has no material cause and is purely spiritual in nature. 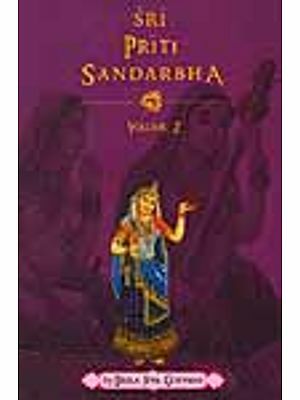 In this second volume of Priti-sandarbha, the author first describes four features of the Lord's personality, called dhirodatta, dhira-prasanta, and dhiroddhata. Then he describes how the pastimes of the Lord are considered in two divisions: those of opulence and power (aisvarya), and those of sweetness (madhurya). Examples are given of devotees who appreciate the opulence of the Lord, and devotees do not consider the opulence of the Lord due to being absorbed in appreciating His transcendental sweetness. While discussing the various relationships that devotees have with the Lord, the uddipanas (impetuses for ecstatic love) are described in detail, as well as the vyabhicaris (disturbing symptoms of ecstatic love), and other forms of ecstasy. The five primary relationships are discussed in this volume, as are the seven secondary relationships. Then, there is a details discussion of rasabhasa (the incompatible mixture of rasa). 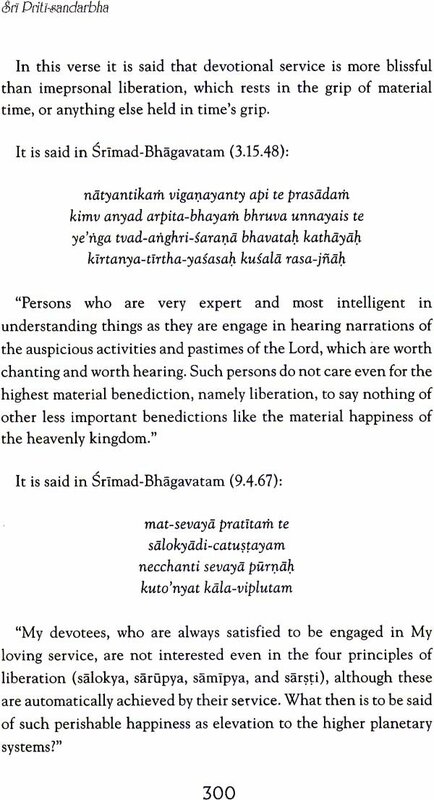 It is very interesting how, in the discussion of rasabhasa, Srila Jiva Gosvami gives many examples of how learned scholars sometimes point out what they feel to be rasabhasa in the verses of the Srimad-Bhagavatam. He cites the supposed existence of rasabhasa and then carefully explains how these are not actually incompatible mixtures of rasas. The author concludes that in the entire Srimad-Bhagavatam, there is no example of rasabhasa. Finally, this volume concludes with a discussion of the gopis' love for Lord Lord Krsna, as well as the love of the Lord's queens at Dvaraka. There is a lengthy discussion of love of the Lord's jpresence, and love in separation. At the end is glorification of the love of Srimati Radharani for Krsna. Srila Prabhupada would sometimes mention the Priti-sandarbha in his lectures, as in the following expert from a lecture on Srimad-Bhagavatam given in London in 1971. Prabhupada: Jiva Gosvami has got six sandarbhas, theses: Bhagavat-sandarbha, Krsna-sandarbha, Tattva-sandarbha, Priti-sandarbha, like that. So, I don't think that these books are published in English. These sandarbhas of Jiva Gosvami are so philosophically discussed that throughout the whole world, there is not a single philosopher who can defy them. We belong to the Gaudiya-sampradaya from Lord Caitanya Mahaprabhu, coming in the disciplic succession of Caitanya Mahaprabhu. We have got immense literature to understand God. One who wants to understand God through philosophy, science, argument and logic to supply them reading material, we have got immense literature. 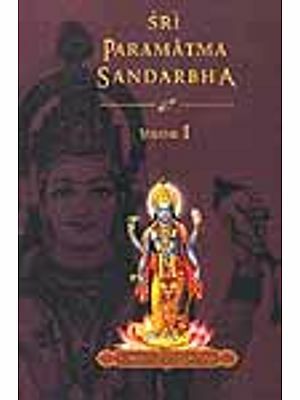 From this we can understand what a great service Kusakratha dasa has done in translating these six sandarbhas. And, as would be expected, these translations are very pleasing to read due to being imbued with Kusakratha dasa's great and unalloyed devotion for the Lord and the literature of the great acaryas.